The Stratasys-MakerBot deal will bring desktop 3D printing closer to the mainstream. Stratasys, the industrial-grade 3D printer manufacturer, will acquire MakerBot for $403 million in stock. 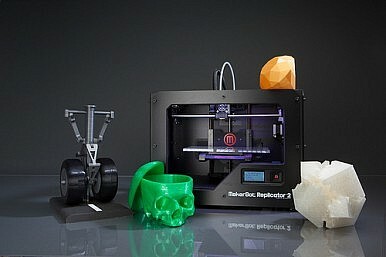 MakerBot, based in New York, specializes in delivering more affordable, consumer-oriented 3D printers. The startup, founded in 2009, produces the Replicator line of desktop 3D printers that have become a favorite among hobbyists around the globe. After yesterday’s deal, Stratasys shares went up 3 percent during after-hours trading. The Stratasys press release states: “Stratasys will initially issue approximately 4.76 million shares in exchange for 100 percent of the outstanding capital stock of MakerBot. The proposed merger has an initial value of $403 million based on Stratasys’ closing stock price of $84.60 as of June 19, 2013.” MakerBot shareholders could also receive a $201 million earn-out (in the form of 2.38 million additional shares) if the company achieves performance goals set by Stratasys. Since entering the market, MakerBot has sold more than 22,000 3D printers. The printers allow consumers and independent designers to print small objects. The current Replicator 2 3D printer has a build volume of 401 cubic inches, allowing it to print objects that are up to 28.5 x 15.3 x 15.5 cm. Using the printer, creative minds have been able to print everything from basic figurines to a fully functioning handgun and replacement body parts. “We have an aggressive model for growth, and partnering with Stratasys will allow us to supercharge our mission to empower individuals to make things using a MakerBot, and allow us to bring 3D technology to more people,” MakerBot CEO Bre Pettis said in a press release. Pettis, who had been a public-school teacher before entering the world of 3D printing, will remain in charge of MakerBot. The brand name, as well as the existing management, will also be preserved. The transaction is expected to be finalized by the third quarter of 2013. So how exactly does 3D printing work? The MakerBot-owned “Thingiverse” is a good place to start. First, an aspiring 3D printer needs to find or create a computer aided design (CAD) file. The file provides the “virtual blueprint” for the desired object, which allows the design to be broken into printable cross-sections, in turn enabling the printer to create the designed object one layer at a time. Depending on which kind of 3D printer you use, the material used to print your object may vary. Spools of plastic filament are the most common “ink” for 3D printing. After inputting the file, the plastic filament is heated by a nozzle and then deposited on the printing surface layer by layer. The final step: Sit back and relax, or better yet, go run some errands. Current-generation 3D printers can take hours – even days – to print a single object. The MakerBot 2 retails for $2,199 – which probably seems quite expensive to the average consumer. However, that price becomes much more reasonable when compared to the larger professional-grade 3D printers that can fetch upwards of $20,000. Specially modified 3D printers use live cells that could theoretically be transplanted. 3D Printing: Expiring Patents Could Usher in New Era for ConsumersThe Trade, Legal, and Institutional Implications of 3D Printing in the Indo-Pacific3D Printing Is Here to Disrupt Asia's Security OrderWill 3D Printing Speedup Production of Russia’s ‘Deadliest Tank’?Samsung Galaxy Round: The Dawn of Flexible-Display Smartphones?